The Netherlands is a home for geese like nowhere else in Europe, according to the Dutch museum of nature Ecomare. Every year over 2 million of them arrive at the start of the winter from colder, northern areas to feed on Dutch pastures. 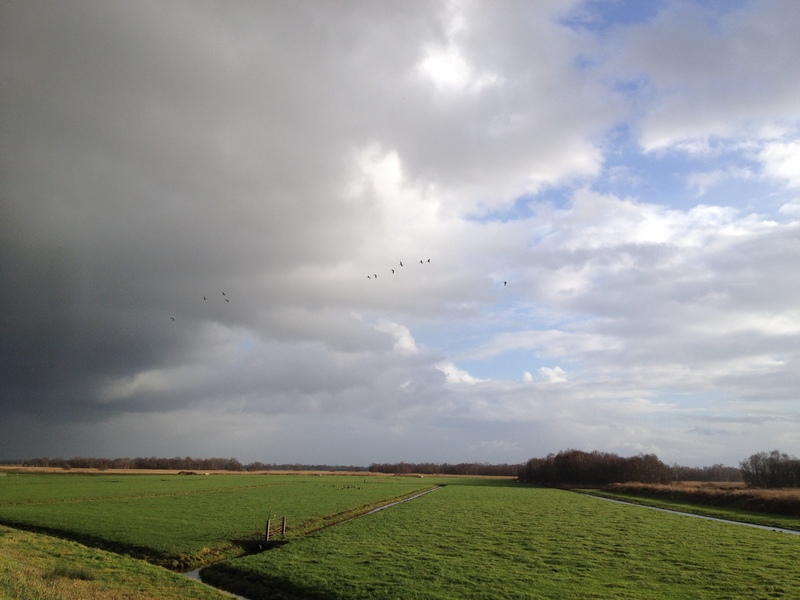 Living on a green and lush polder, a typical Dutch bit of reclaimed land, I see the geese arrive in their impressive V formations and enjoy listening to their honking sounds. In the past, their arrival marked the season of frost (the V formation reminded people of the Dutch word for frost: vorst). As the climate changes, this is no longer the case and more geese don’t bother leaving the Netherlands: they stay here during the summer as well. The value of learning is rarely disputed. What the learning outcome should be, is a different matter. Is it enough to acquire information? Is it also important to learn how to do something? Does it matter how a learner feels about training and its content? In modern learning theories, they all matter: knowledge, skills and attitude. When we seek a cognitive outcome for training, its main objective is to increase the knowledge base of learners. Knowledge refers to information like facts, procedures and protocols. Some learning theories distinguish between types of knowledge: descriptive knowledge (knowing something is the case) and procedural knowledge (knowing how to do something). Other learning theories underline knowledge organization and cognitive strategies. In all cases, knowledge acquisition in training can be easily assessed. A test, either in multiple-choice, true-false or free recall format, measures retention of knowledge. When the objective of training is the application of knowledge in order to accomplish something, the learning outcome is skill-based. Theories on skill development mention different stages, like acquisition, compilation (continued practise) and automaticity (being able to perform a task quickly and individualize it). Traditionally, skill development is assessed through role plays (simulations during a training) or in observation of actual job behavior. Games and simulations have increased options for skill assessment. Like knowledge and skills, attitude is manifested in behavior. It refers to thoughts and feelings towards the subject matter of training (the affective component) but also towards the learning process (the motivational component). Acquisition of key norms and values are examples of attitude outcomes of training, but also organizational commitment, acknowledgement of diversity, concerns for safety, and recognizing what is important to learn. Attitude of learners can be changed and “synced” with standards of the organization: to do so is a precondition for gaining knowledge and skills. Attitude-based training, therefore, precedes knowledge- and skill-based training. Assessment of attitude can be done through pre- and post- training questionnaires, or through self-reporting. An effective training and development program contains knowledge, skills and attitudes, and the assessment of their acquisition and/or implementation. Regardless of the subject, training should result in improved knowledge, improved skills and an improved attitude toward the subject matter and training process. A few weeks ago I saw a beautiful bird of prey up close. It was resting on a branch two metres from me, staring at me and probably wondering why I was smiling back dorkishly. The experience was amazing, I told a friend. “Why didn’t you put it on facebook?” he responded. His reply struck me because that same day I had read about a very similar situation in a novel: a girl had enjoyed watching birds without posting a message in the social media about it – and was reprimanded for it. The Circle inspired me to take a break from my favorite social medium for 30 days. Facebook’s digital calories had ceased to be harmless for me, particularly at work. Whenever I was confronted with a ‘cue’, a challenging work tasks, I routinely switched to Facebook to look for distraction. This habit of procrastination gave only temporary pleasure: I felt I was wasting my time and was disappointed in myself for failing to work in a focused mode. The only solution was to break the routine and quit Facebook in order to face work challenges head-on. The reward was improved concentration, finished tasks and a great sense of accomplishment. But the experiment had another reward. Building strong neural structures to remember facts or events is empowering and crucial to enjoy our personal and professional life. Forgetting, however, is equally important: having a memory superseded by something else, discarding information that is in conflict with new learning. I might see a rare bird and by not recording it in a Facebook post, I risk forgetting that experience. Having quit Facebook, I realised that for me forgetting is an essential luxury for a healthy memory.